Leading Manufacturer and Exporter from Jaipur, our product range includes Garden Gazebo such as Heritage Gazebo, Antique Gazebo and Patio Gazebo. Being counted amongst the top most names of the industry, we are involved in offering Antique Outdoor Gazebo & Garden Gazebo. 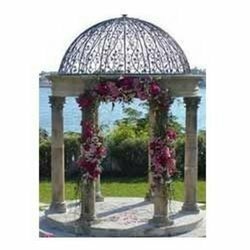 These Antique Gazebos that we offer helps to give a unique and eye catching look. These Antique Gazebos are manufactured under the supervision of experts and are highly quality tested. With the implementation of modern and advanced technology, we are offering Heritage Gazebo. These Heritage Gazebos that we offer are highly demanded in the industry for the exotic designs and patterns that we offer. In addition, these Heritage Gazebos are available in compact designs and have flawless finish.